9 x 9 NESO TENT and 7FT TALL (PERIWINKLE BLUE). It can easily fit over your shoulder or in your carry-on. Use sand or rocks to stabilize, so you’ll always have shade for your next adventure. The Neso Tents team is united in their love of the outdoors. 7 x 7 NESO TENT (WHITE). It can easily fit over your shoulder or in your carry-on. Use sand or rocks to stabilize, so you’ll always have shade for your next adventure. The Neso Tents team is united in their love of the outdoors. Gear up for your next outdoor adventure with the Ozark Trail 4-Person ConnecTent for Canopy. It connects to an existing straight leg canopy tent (not included), making it suitable not only for camping but also for tailgate parties. Features: Type: Pop-up Tent Material: 170T Waterproof Polyester Fabric Fiberglass Rod Color: Blue & Orange Size: 200 x 150 x 110cm/ 78 x 59 x 43inch (L x W x H) Capacity Person: 1-2 Person Item Weight: 2.97 pounds Opportunity: Camping, Hiking, Beach, Fishing, etc. Up for sale is a Golden Bear 2 person Sierra Lite 2 tent. Floor size is 7'3" x 5'. Center height is 46". Weight is 3.5lbs. See pictures for details. This is a used tent, but the rainfly, poles, stakes, and all parts are included. The carrying case has a long cut. Sold as-is. 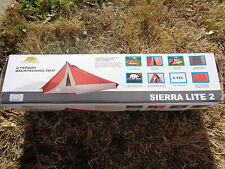 Sierra Designs Clip Flashlight 2 Tent, NEW 2019 Model, FREE SHIPPING! This Ozark Trail 14-Person 4-Room Base Camp Tent has a straight wall design to provide 235 sqft of living space. Ideal for 14 campers in sleeping bags or 5 queen airbeds, this tent is huge! It sets up easily with two people in 20 minutes. These extra stakes will assure your tarp is getting the maximum anchoring power, on any given terrain! With our tent tarp set, you get everything you need to stay dry, cozy, and oh so comfortable. Dependable and versatile, so you can get to rest or get back to your adventure, minus the hassle. 7 x 7 NESO TENT (BLACK). It can easily fit over your shoulder or in your carry-on. Use sand or rocks to stabilize, so you’ll always have shade for your next adventure. The Neso Tents team is united in their love of the outdoors. Item model number: 2000010331. Get better airflow with the Coleman Rainfly Accessory for 6-Person Instant Tent. This rainfly for the Coleman 6-Person Instant Tent, 10 x 9, allows you to crack your windows during a downpour and still stay better airflow when camping in your Coleman Instant six-person tent with this Instant tent rainfly. Finether 5-6 Person Pop Up Tent Outdoor Ultralight Waterproof Family Tent All Season Camping Shelter with Carrying Bag for Camping Hiking Traveling Park Beach. Simply take from the carry bag, “pop” it open and then peg it out. Freestanding design is easy to set up and take down. The high-performance NTK outdoor camping tent also has a buckle system for fast and easy pitch. It’s a perfect addition to your camping and hiking gear. UPGRADED DOOR, MULTIPLE USE: Zipped door is equipped with velcro to make for more convenient entrance and exit. The Privacy Tent is ideal as dressing tent, shower tent, and toilet, and is perfect for camping or hiking. Sierra Designs High Route 1 Person Tent, Ultralight, NEW 2019 Model, FREE SHIP! This is a new-for 2019 tent. NOTE : This tent requires the use of trekking poles. Only weighs 1 lb., 15 oz. Ozark Trail 6-Person 10 x 10 ft. ConnecTent™ for Straight-leg Canopy This 6-person camping tent cannot stand alone without the canopy (canopy not included). 2-3 season tent. E-port provides easy access for an extension cord. Mosquito Killer. Hitch Step. 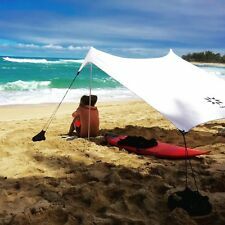 Waterproof & UV resistant 190T polyester used as a shelter or a beach tent. Model: Instant Tent. 1 x Tent ( include the accessories ). 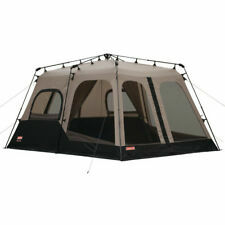 Large enough for up to 5-6 people Ideal for family camping and outdoor activities such as hiking & picnic. tree tent 2 person hamock easy carry . Condition is New. Shipped with USPS Parcel Select Ground. Tent Cavity: 82" x 71" x 48". 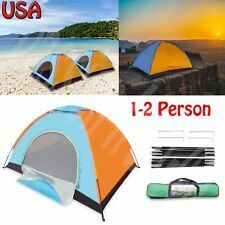 - 4 Person Tent. - Unique automatic pole system, one piece design. - One Step Setup. - Setup in 2 Seconds, folds down in 5. Trekking Poles are NOT included, this tent is intended for use with your own Trekking Poles, but can also be used by tying the peak to a low hanging tree branch - see pictures. This Tent includes 8 ultralight red aluminum stakes, guy lines, and carry bag. Simply lift up the top of the tent and it will automatic installation. Hydraulic system is more durable than other spring system. -Eight aluminum spikes are attached to make the tent stronger. -After instant open, use nails to fix size poles ends which can firm the tent against wind effectively. Walrus Micro Swift One Person Tent - Great! Stakes, fly, tent is all there. The built-in room divider lets you enjoy the light on one side, while the Dark RestTM technology is featured on the other side. Multiple skylights with interior ceiling panels allow you to customize the light, and can be rolled back for stargazing or extra interior illumination. Made from. 67 Camoflauge cuben fiber. This one fits a Snowpeak 900 Cookset or Snowpeak Trek 1400 cookset, Jet Boil Stoves, MSR Wind Burner Stoves, MSR Windburner Duo, MSR 1.0 & 1.7 Reactor Stove system. Simply take from the carry bag, “pop” it open and then peg it out. 1x Finether 3-Person Pop Up Tent. Longer lasting fly fabric with PU coating. Net Weight: 8 lbs (3.6 kg). Easy access through extra high door entrance. Simply take from the carry bag, “pop” it open and then peg it out. Finether5-Person Pop Up Tent OutdoorUltralight Waterproof Family TentAll Season Camping Shelterwith Carrying Bag for Camping Hiking Traveling Park Beach. Condition: Pre-owned - shows normal wear from use. The only real issue is the hole on the back side. They can be patched. Otherwise it's in nice condition for the age. Size/Model: 1 Person. The Guide Gear Compact-size Truck Tent deploys in minutes in pickup beds, providing a fast, comfortable shelter that gets you up off the ground. Topnotch construction, excellent ventilation, and adaptable options make the choice easy. ➤Surprise! The tent weight is 1.98 lbs. (I guess you can't find). ➤Say Goodbye to Sultry: There is a vent at the bottom and top of the tent which can make the air circulate. You can open and close it so that regulating the air flow through the tent effectively. Lightweight Camping Hiking Pyramid Tent Trekking Pole Net Canopy. Tent Size (L x W x H): Approx. 270x160x125cm / 8.9x5.2x4.1ft. Net Canopy Size (L x W x H): Approx. 230x90x115cm / 7.5x3x3.8ft. Product Type: OUTDOOR RECREATION PRODUCT. AUTOMATIC POP UP - Pitching a tent will no longer be a hassle. Just throw it in the air and it opens up. 1 - 2 PERSON TENT - Comfortably fit 3 children OR 2 adults. Has spikes and string to secure the tent.